How do you get started?? You will need your Roachdale Public Library card number and PIN (the last 4 numbers of your library card – contact us if you need it reset). We are using the same platform as the Putnam County Public Library, so if you are not a Roachdale/Franklin Township resident, you can STILL use the service. You’ll just need your Putnam County Library card number and PIN (the last 4 digits of your phone number). Now even EASIER to access – download the new app : Meet Libby! ** OverDrive is statewide! New offerings are added daily from libraries across the state! E-books for toddlers & preschoolers????? 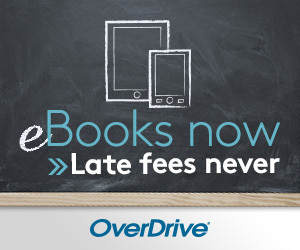 For parents and grandparents who utilize phones or tablets with their young ones, OverDrive does offer options for FREE books and streamed videos. Narrated books are one option – the text is highlighted as the book is read out loud. There are a variety of favorite characters ( Clifford, Dora, Paw Patrol, Bubble Guppies) in addition to favorite classic stories. Streamed films include cartoons (Inspector Gadget), book characters (Madeline), and TV episodes (Sid the Science Kid). If you are planning to utilize OverDrive for toddlers or preschoolers, we recommend getting a library card for the child, as you will have 5 check-outs at a time. You are also able to control what your child is able to see using parental controls or using the kids’ room entry. Take a look at some offerings here: OverDrive – Get started! Welcome to Roachdale-Franklin Township Public Library!